We recently compiled every Lilly Pulitzer print we've ever had into a single-page fabric library, and in doing so, I came across this dress I'd almost forgotten. It was a Lilly Pulitzer dress we'd sold over fifteen years ago. 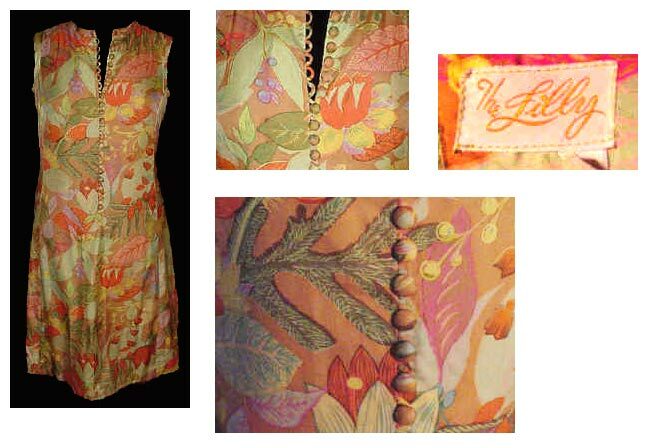 At the time, our business was so young I don't think I knew it was a special dress, though I knew Lilly was a special designer. She's always had a dear place in my heart because we're both Floridians. But this dress is a rare one. Lilly Pulitzer prints are known for their bright florals in tropical, often fluorescent colors. This dress is autumnal, in earthy hues and an especially soft fabric that felt like a Pima cotton. It's hard to justify the word "rare" in mid-century ready-to-wear, but I've never seen another Lilly Pulitzer like this one, fifteen years later. I think I can place the word rare as its descriptor without much hesitation. I wonder if Lilly was trying to capture another season... she nailed spring and summer, but there are no fall or winter Lilly Pulitzer clothes to speak of. It seems this look was as close as she got.